This is a follow up to Dr Lovett’s classic text, ‘Small Wonders’, published in 1999. I first met Dr Lovett at a workshop on healing preverbal trauma given in 2004. Thus I very much looked forward to her latest book. The clinical stories start with the story of a two year old adopted from a Chinese orphanage where she spent nineteen months of her life. Readers are introduced to strategies to manage the insecure attachment including the Marschak Interaction Method. She fulfilled the criteria for developmental trauma disorder. Dr Bessel van der Kolk coined this term in 2005. Dr Lovett concluded that early intervention prevented a possible diagnosis of ADHD or bipolar disorder and a possible lifetime on medication. Further cases include examples where the child’s behaviour was influenced by events that occurred age two when preverbal trauma was not stored cognitively. This involves complete modification of EMDR, which was originally developed as a form of therapy for adults. Trauma from hospitalization is also discussed, for example, a three year old who was hospitalized for asthma age 16 months. Readers are introduced to Dr Lovett’s ‘Once upon a time’ story. The first part tells the child ‘s positive qualities, the second part describes what happened in the hospital and the final part explains what the child now understands compared to the lack of understanding present at the time they were hospitalized. Untreated this medical trauma can have lifelong negative consequences. Babies born prematurely often spend time in neonatal intensive care units. Dr Lovett, given her training as a paediatrician, expertly handles the sensory trauma. It may take many sessions to establish an effecting trauma narrative for reprocessing via alternating bilateral stimulation. Dr Lovett uses tapping and buzzers, which are much more effective than eye movements used in EMDR with adults. Dealing with the loss of a parent and victims of abuse, neglect and exploitation are explained with a list of guiding principles for therapists. Part II deals with cultivating positive emotions with strategies for enhancing a child’s strengths. Another chapter deals with games for promoting connection and cooperation. The book concludes with guidelines for writing a therapeutic narrative and how to use this to resolve trauma. 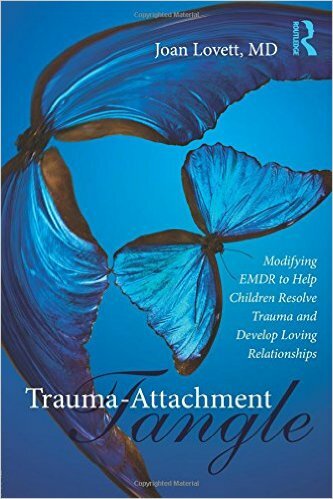 In conclusion I would recommend this book as an essential addition to the armamentarium of psychotherapists who are using trauma-focused approaches in their work with children and families. Dr Lovett over the last 16 years has built up a large database of practice-based evidence for her techniques. At present I believe this is the gold standard for management of preverbal trauma and should be widely adopted among suitably qualified practitioners.